Anchorage, Alaska – The Alaska Federation of Natives (AFN) is pleased to announce the selection of the keynote speaker for its 2018 Convention, which will take place October 18-20 at the Dena’ina Center in Anchorage, Alaska. Lt. Governor Valerie Nurr’araaluk Davidson will address the thousands of delegates and attendees at the convention on Thursday, October 18, 2018. 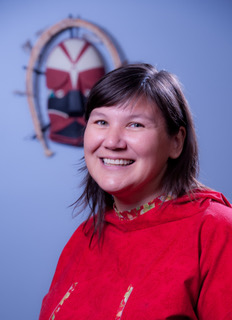 Valerie Nurr’araaluk Davidson was appointed Commissioner of the Alaska Department of Health & Social Services (DHSS) by Governor Bill Walker in December 2014. She lead nine state divisions within the department to promote and protect the health and well-being of Alaskans. Davidson is an enrolled tribal member of the Orutsararmiut Native Council (ONC). Davidson has worked for over 15 years as a national policy maker on matters affecting Indian health. She served as the Senior Director of Legal and Intergovernmental Affairs for the Alaska Native Tribal Health Consortium, where she represented Alaska Native health needs at federal and state levels. Davidson served as Chair of the Tribal Technical Advisory Group to the Centers for Medicare and Medicaid Services (CMS) from its inception in 2004 until August 2014. She represented all tribes over a period that spanned the terms of several Secretaries of Health & Human Services and under both Republican and Democratic administrations. Davidson was also the spokesperson, chief political and legal strategist for ANTHC’s Dental Health Aide Therapy Program, the country’s first mid-level dental program. Davidson served for 11 years as the Technical Co-Lead Negotiator of the Alaska Tribal Health Compact and served on a team to negotiate agreements with the Veterans Administration that allow rural veterans to seek care in their home communities. Valerie also negotiated a tri-party agreement to streamline rural sanitation construction projects with the U.S. Department of Agriculture, the State of Alaska and the Alaska Native Tribal Health Consortium. Davidson also served as Chair of The Foraker Group, Chair of the Alaska Commission on Children and Youth, as a member of the Alaska Health Care Commission, and the U.S. Department of Justice Advisory Committee on American Indian and Alaska Native Children Exposed to Violence. She currently serves as a Trustee of the First Alaskans Institute. Davidson earned her juris doctorate, with a certificate in Indian law, from the University of New Mexico School of Law, and a bachelor’s degree in education with a minor in bilingual education from University of Alaska Southeast. Davidson, a Yup’ik, was born in Bethel. The 2018 Convention theme, “Innovation in the Past, Present and Future,” celebrates the benefits of innovation and the necessity of continuing to strive for, seek, and facilitate innovation as we move through the 21st Century.